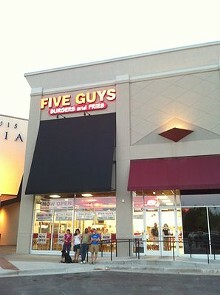 Five Guys was founded in Arlington, Virginia, in 1986. There are now more than 300 Five Guys locations spread across 25 states. The menu is blissfully simple: burgers, hot dogs and fries. The regular burger has two thin patties, the “little” burger one. You can order your burger plain, with cheese, with bacon or with cheese and bacon. All of the other toppings are free. The list is standard, with raw jalapeño slices being the most exotic. The burgers are terrific, and the French fries are just about perfect. The whole operation is impressively efficient, fast food as it ought to be.